Download free e-books to learn more about how WiFi marketing can help your business. Learn how leading industry companies are using Aislelabs enterprise-grade technology. Explore more about what we do, read guides, and keep up with Aislelabs news. Marketing automation for brick and mortar spaces such as malls, stores, restaurants, and venues. Utilize machine learning technology to run sophisticated marketing campaigns engaging customers visiting your brick-and-mortar venues. Target them across all digital channels including social, email, surveys, and online advertising with a clear understanding of the ROI and traffic each campaign drives to your venue. Go beyond opens and clicks to quantify real success in terms of increased footfall and sales. 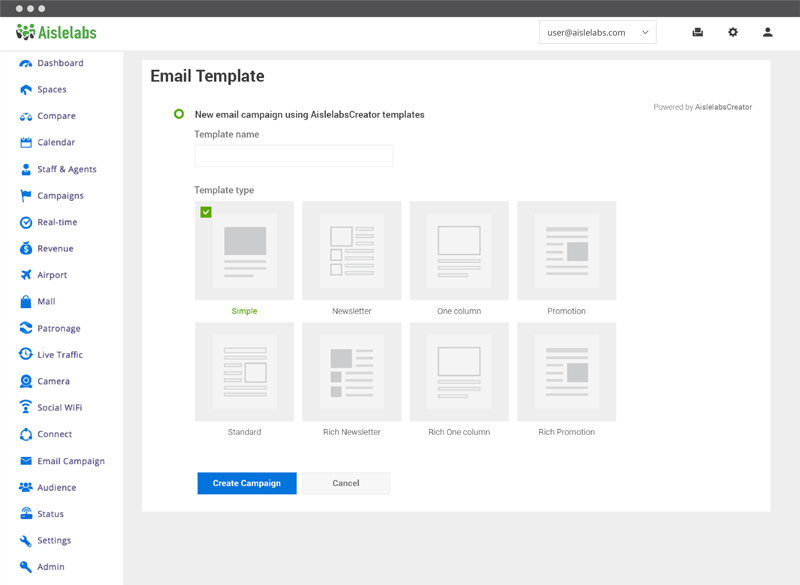 Seamlessly run advanced campaigns across multiple channels from a single unified platform. Let the power of artificial intelligence and deep learning identify the right audience group for each campaign objective to deliver messages with a personalized touch. Go beyond opens and clicks. Measure the ROI of each campaign in real footfall traffic, sales, and repeat visitors. Drive shoppers to your stores with effective multi-channel marketing. Enable holistic, multi-channel targeting of your in-store visitors in a unique way. Run a unified platform for email, surveys, social marketing, and digital advertisements that target all your in-venue visitors. Effortlessly identify and target the right people at the right time using powerful machine learning. Automatically identify the best customers to target to increase repeat visitors, obtain feedback for your venues, and increase rave reviews. 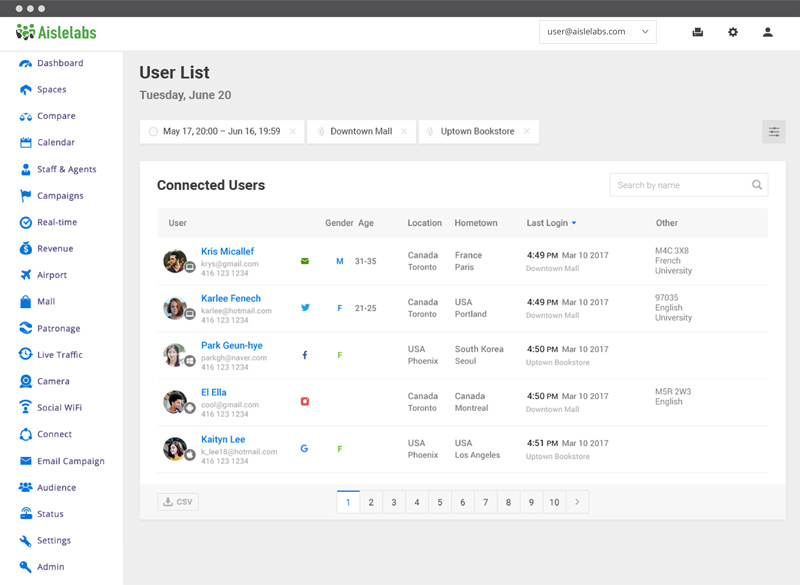 Integrate with the Flow, Social WiFi, and Connect platforms and use the same customer databases or upload your own. Use behavioral data to execute holistic campaigns with a clear understanding of the ROI. 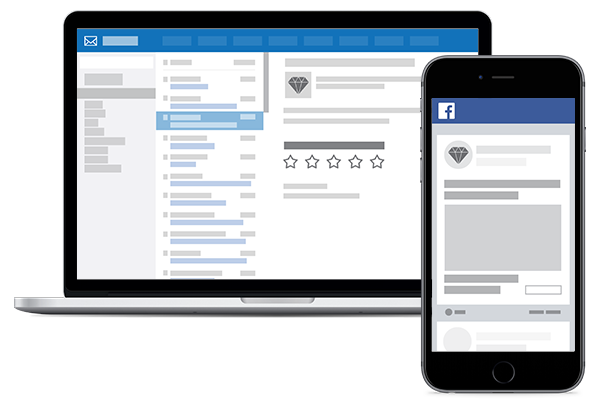 Integrate with Facebook, Google, Instagram, and more to create highly targeted advertisements. Execute campaigns across multiple venues utilizing all digital platforms that matter. 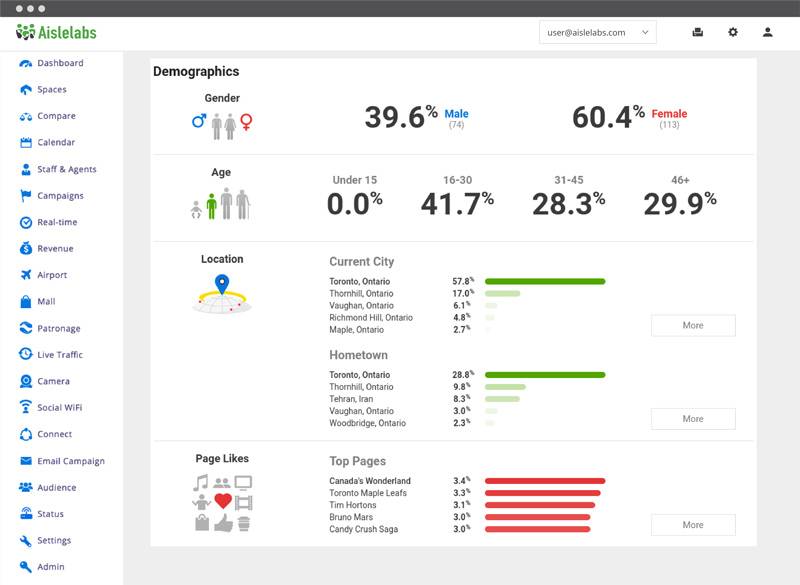 Measure the number of returning visitors to your venues by targeting and engaging them during or after an actual store visit. 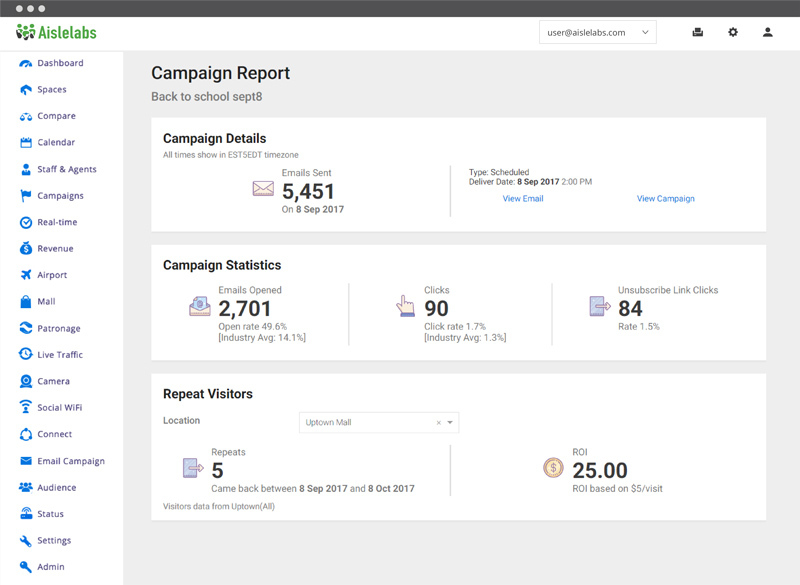 Complete the digital marketing loop with visit attribution as well as optimizing effective campaign messages. 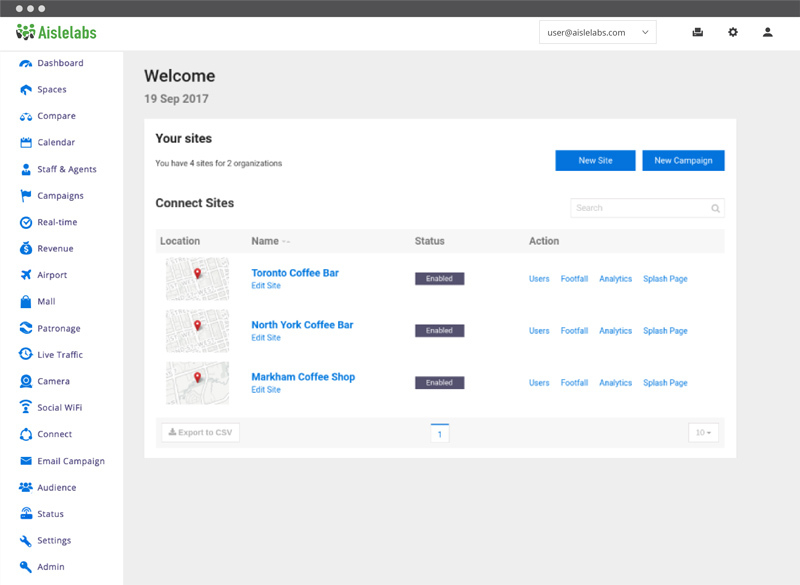 Enhance your reach across all customers with built-in Aislelabs Social WiFi and Connect integration. Measure the effectiveness of your marketing beyond opens and clicks. Identify real customers that result from your marketing actions. 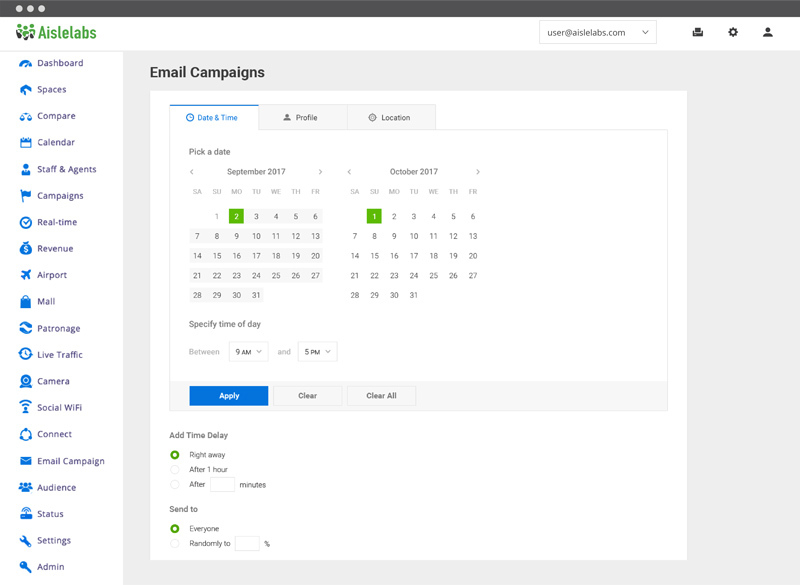 Utilize the fully featured built-in design tools to create elegant emails, surveys, and social content. Run campaigns set to commence at any time. Engage your visitors as soon as they enter or leave your establishment. Break free from silos by integrating with popular enterprise Marketing Clouds and CRMs such as Salesforce, Adobe, MailChimp, Silverpop, and more. Run multiple campaigns and target visitors at hundreds of your locations, all at once. Visualize the results by individual location or as a collective whole.